Charles and Mary have helped restore me – helped soothe the some-time ‘abrasiveness’ of living in a populous Indian city. The couple’s three-wheeler is tucked against a wall in a quiet leafy street, five or so blocks away from our apartment. After a long Sunday morning walk, we find them sizzling masala omelettes and fluffy dosas on their cast irons. When they reveal they’ve been setting up here for twenty-seven years, I suggest that they must have been the original ‘food truck’. They’re happy to have the attention and we spend some time together. The tools of their trade are neatly stacked and at the ready: variants of stainless steel, gas burners and tanks, prepped veggies. Charles dips his hand into the bucket of chopped chilies and onions, giving it a further blend. Mary shyly reveals that June 14th is their anniversary. “Thirty-one years together and this,” she gestures with a sweep of the hand across their thriving business. They are in perfect sync as they prepare their street food. Motioning to a photo gazing magisterially down at them, Charles wants me to notice the small shrine. “We’re Christians, Mother Mary and Jesus.” He nods at his Mary as if counting his many blessings. As workers from a nearby high-rise construction site make a beeline for Mary’s dosas, we take our leave – a few dosas and omelettes in hand. A young lady floats past on the street, her sari matching the stunning blooms of a Scarlet Cordia. It’s been an inspiring corner: the vibrance of colour and the personal, genuine encounters. I pause to reflect…yes, it’s almost always about the people isn’t it? After more than two months away, it’s been wonderful to be back in my modern Bangalore apartment with its soft hues of greens, blues and whites – its cool marble floors and lush ‘mural’ of trees and coconut palms beyond. It’s been a relief to sit at my desk and write in one spot. For much of the first week I cocooned myself; to transition, to slow down and yield to jet lag, to finally unpack. “How lovely, your homes have been repainted,” I commented, noticing the lemony wash on the aging villas. 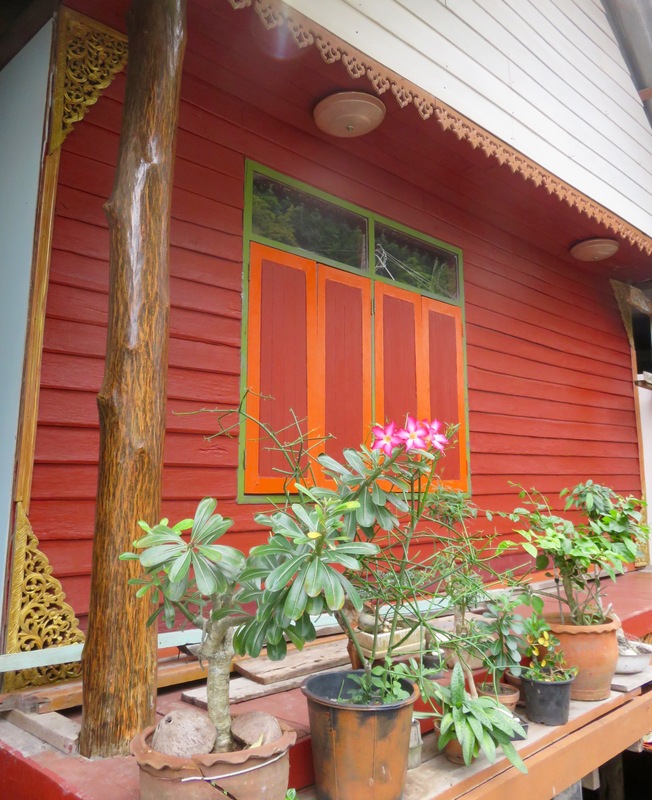 Now somewhat restored to their former glory, their statuesque mango tree is now framed more prettily. “Mangos are soon ready,” Anu said, pointing to the masses of plumping fruit. The next day a hefty bag of mangos was presented by our landlord. “Welcome back,” Nando said in his affable manner, “the gift of mangos.” He has also recently returned after time in his other home in Belize. He and his wife will now spend six months enjoying the downtown view from their perch on the top floor – from their terrace that floats amongst the tree tops. “Come up for a drink sometime,” Nando adds. “We will,” I agreed, “you’ll have to meet our Matt.” And as is the Indian way, drinks will start about 9, dinner not served until at least 11 pm. On my second week home, I became absorbed with my book and also with another writing project. One which demands honesty and vulnerability, and so I’ll continue along that vein. Matt is here with us in Bangalore, it’s been some years since he was last in Asia. He’s embraced the neighbourhood, the food (especially Preya’s) and he’s also opened our eyes. Seeing a place anew through someone else’s perspective is always thought-provoking. Not long after arriving, Matt returned from the nearby five-star hotel that is also our club. “They treat you like royalty, almost over the top. Does it get tiring?” he asked. My mind paused…it struck me that I take this completely in my stride. Yet this is my present reality. “I love it too. And I never tire of this view, it’s my solace,” I told him. And in saying that, the question was…solace from what exactly? While I was away, I was interviewed from afar by the Economic Times of Bangalore. The article featured me as a writer and as an expat living in this booming city. What did I think of the city? Why was I here? What did you know of the city before you arrived? I mentioned how Bangalore’s people and history inspired me to write. How I could relate equally to security guards who leave their villages to work and to altruistic entrepreneurs who give up careers to care for children in need. I’m fortunate to hear their voices and write their stories. I was pressed to compare Bangalore with other former homes – Osaka, Amsterdam, Aberdeen, Doha, Muscat, Stavanger, Aktau and Houston. Encouraged to give anecdotes, even as a writer I asked myself…how honest should I be? Too many answers, where do I start? I related that I love the unexpected. What’s around the corner. 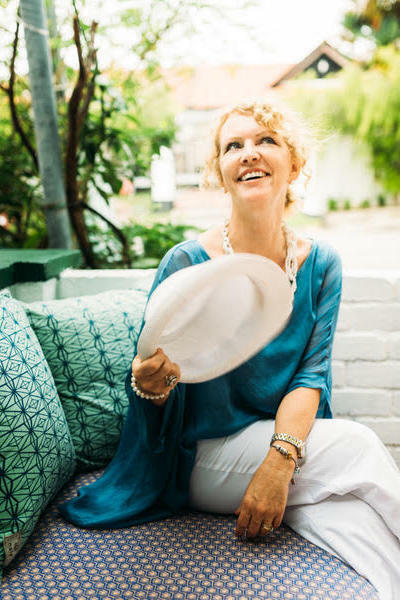 I adore the tropical greens, the vivid saris and sumptuous fabrics, the spicy curries, the moveable feasts of fruit and vegetables carts and the cool roof-top bars. And wonderfully, I am always made to feel at home. But I was also honest. But there is an unwritten rule in an expat life; one shouldn’t offend their host country. I try to live by this. Yet just once, I’d love for someone to allow me to cross a street safely. Could traffic yield to me while I’m on a cross-walk. Perhaps education from the government to educate. Elevated pedestrian bridges to avoid the senseless monthly death-toll. Should this not be a basic human right in a city that attracts investment from companies worldwide? “Mom has anyone ever stopped for you?” Matt asked one day, alarmed by the craziness. “Yes”, I answered, “Twice.” He was amused that I actually had an exact number for him. These are a few negatives that I might have mentioned in the article, had I been more candid. After time in pedestrian and cycle-friendly Holland and the beautiful mountains and cityscapes of Canada, there is the inevitable adjustment to India. This coming and going in an expat life takes one across the full spectrum of experiences and emotions, there are many of them. When adjusting back into this other world, exploring is often my antidote. This past weekend we headed to Bangalore Fort with its gate ‘tall enough for an elephant plus howdah‘ and its robust Islamic-styled granite walls. It stands testament to the struggle of the Mysore Empire against the British. I had been here before but again I’m captivated by its imposing elegance. Tipu Sultan’s Summer Palace is close by, beautifully adorned teakwood pillars, arches and balconies, evoking scenes of the great Sultan holding court, planning his strategy to hold back the British. Now, the fanned traveller’s palms and nearby temples evoke peace, not war. Serenity, not plunder. I soaked it up, breathed it in, not wanting to leave the hushed walls and enter back into the fray of the frenetic streets. These landmarks of Bangalore’s history stand in one of the older pets, those neighbourhoods where many people barely scrape by…day by day, rupee to rupee. After taking photos of the fort and the palace, I put my camera away. That day I didn’t feel comfortable taking photos of vendors who line the streets. The wallahs for whom I have great respect and often empathy for…the back-bone of this country of 1.3 billion people. Many do well, like our Raj, but many sit under the baking sun; maybe just a few limes to sell, some shrivelled brinjal that no one is going to buy. And simply, many are too young. “Let’s go home,’ Matt said, “I feel like I’m intruding.” That sentiment has crossed my mind many times. The wallahs are hard working and a contrast to those who beg for alms; but then I can’t judge their circumstances. It remains disconcerting for me, the inequity never making sense either to ‘seasoned veterans’ or ‘fresh eyes’. The following Sunday morning we walk through nearby Cubbon Park. It’s not exactly manicured, but lush and peaceful nevertheless. There are glimpses of the city’s past as a British cantonment, military legacy of the final Mysore war. A reminder of when residents strolled through this once glorious ‘garden city’. We come upon the Government Museum, a 19th century neoclassical. A troop of gardeners and one security guard, are digging ragweed from the lawn. “Good Morning sir, you’re working early. And you’re making progress,” I offer, spying a pile of weeds. The guard introduces himself and adds, ‘Yes too many weeds are there, much work.” Motioning to Matt to give it a try, he hands him the weeding tool. He watches as his new apprentice-gardner up-roots a few pesky weeds, encouraging me to take a photo. A brief but sincere encounter…the geniality of Southern India. We meander to another neighbourhood, the small houses making rainbows of colours. Without hesitation, the children run to me, “Auntie, auntie, where from?” They are playing happily in the street, pestering at the local corner store and as always, pleading for their photo to be taken. It seems that households have been busy. Reams of laundry dry in the warm June morning, dishes await scrubbing, garlands decorate doorways and a young mother poses eagerly with her toddler. The colours and images are vivid and again I reflect that this is when I’m most content in India. On peaceful streets with daily activities like anywhere else – without the reminders of perpetual toil and poverty. As we make our way out of the neighbourhood, a pack of mangy dogs mark us as interlopers. They snarl and yap until a kindly lady steps away from her heaped cart of pots and pans. Offering her apologies, she escorts us around the corner, swiping and scolding the mutts. The chickens let us pass. So I come full circle to Charles and Mary at the end of that second outing. It was as if they greeted us back to our own bustling, yet reassuring neighbourhood, more privileged than most yet still typical. Vibrant colours, chaotic traffic, life lived on the streets – lives of difficulty and of prosperity. Simply, it is India. Above all what I’ve come to love here is its people. I respect their industriousness and for many their perseverance. So yes, I could have added more to that article. I would have implored the government to do more: fix the sidewalks, protect the trees and greens spaces, combat the pollution, ensure the water supply for farmers and for all, try to eradicate the vast inequities. People like Charles and Mary, Raj, Kajul, Preya, the children who welcomed me as ‘auntie’, they all deserve a voice. I advocate for them, not myself, my time here will be only another year. I embrace India for the complex layered story that it is and I’ll continue to cherish the beautiful spirit of the people. And so I await the next playful unpredictability, the next enchanting exploration and naturally more sincere encounters to come. It seems that will happen this coming weekend. It’s time to initiate Matt into Indian train travel, a passage to the bewitching ruins of Hampi has been booked. Another chapter in our Indian story. We packed our pens and notebooks for a grown-up field trip. 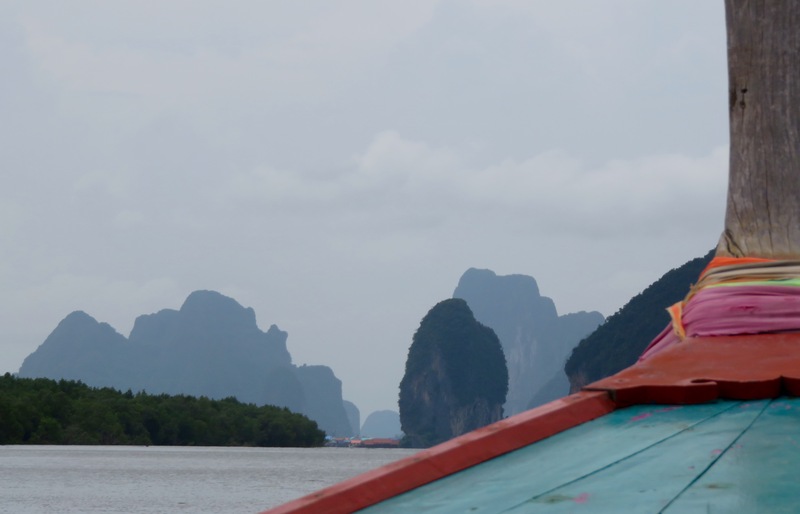 With our hats donned and cameras poised, the destination was Koh Panyee, in the inlet of Thailand. I had been here before with my family. This time however, a writing assignment was on my mind. The village of Koh Panyee is surrounded by shadowy, fingerlike mountains. Reaching up from calm waters, they are serene, yet evocative and mysterious as they entice visitors into their enclave. As our longboat glides into the harbour, we circumvent fish lines and crab traps, and groups of traditional longboats. This is how one arrives in Koh Panyee…for it’s a village that resides on bamboo stilts. Sturdy longboats have long been the desired mode of transport in these waters. A solid column rises from their prow like an upturned tail. Adorned with vibrant tassels of cloth, I’m told they protect the safety and spirit of the vessel. Thai people believe that each mode of transport possesses a spirit, so best to honour and respect it. 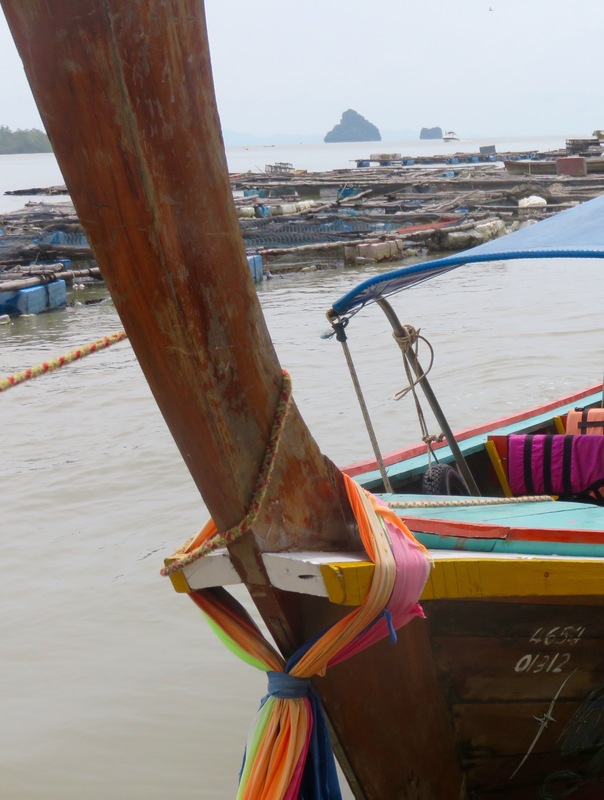 The swishes of cloth compliment the often brightly painted vessels and provide a grip for fishermen to drag their boats home into shallow waters. 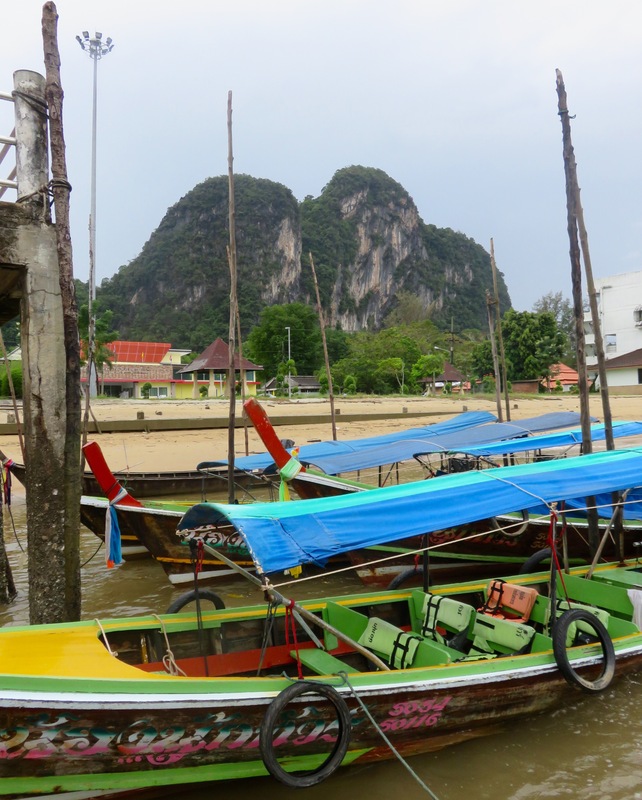 Koh Panyee’s population is descended from just two seafaring Muslim families. Settling here at the end of the 18th century, the fishing trade that they established is still evident as we disembark on the simple dock. 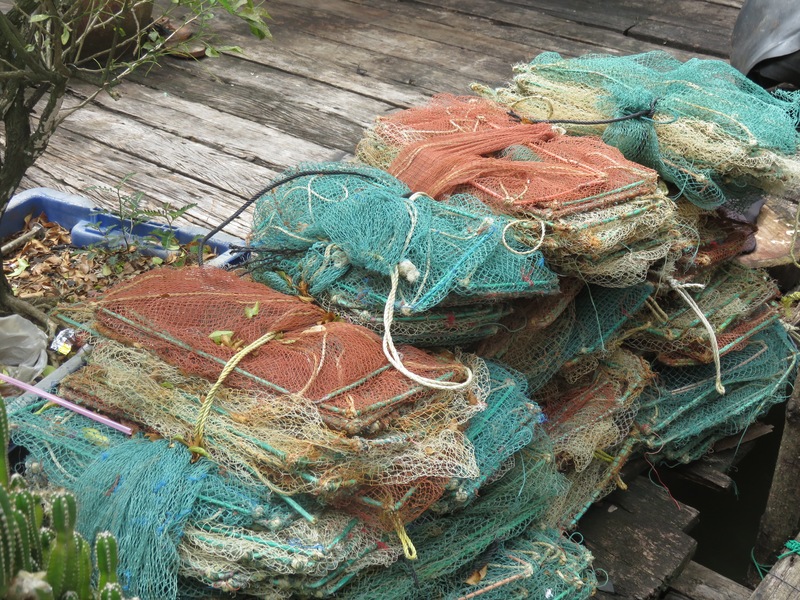 Bamboo fish traps rest on knotted planks, tangles of nets cluster on poles and colourful netted piles lay at the ready. 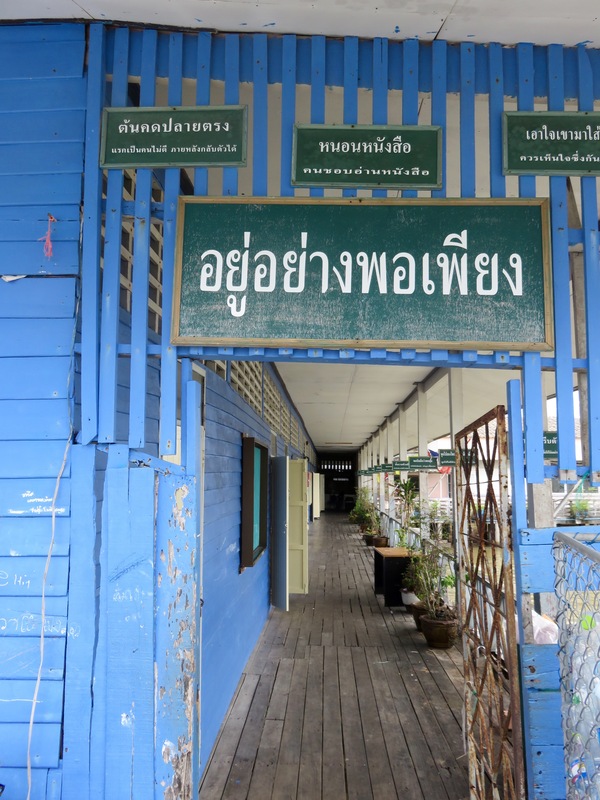 A puzzle of spartan homes and shop fronts greet visitors to Koh Panyee. This once secluded island has welcomed tourism. ‘James Bond Island’ is nearby which attracts sightseers and snorkelers alike. 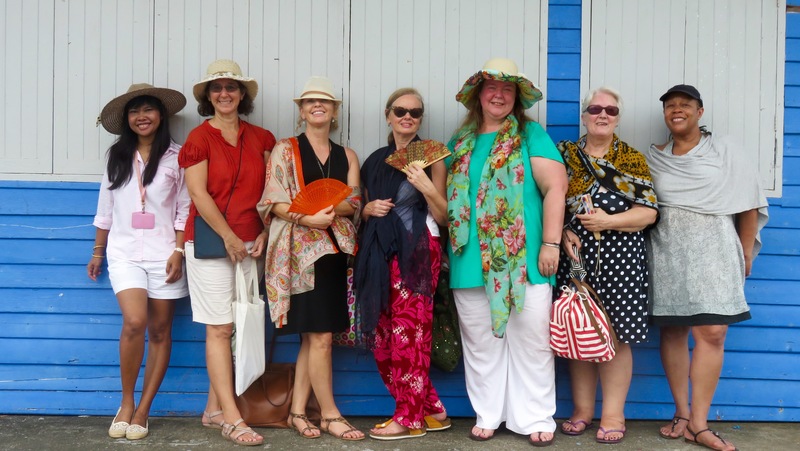 After disembarking, we wander the humid labyrinth that offers the usual array of elephant printed skirts, frocks, sarongs and slouchy bags. By day five in Thailand, we’re a little more discerning and hope for something unique. And we soon find it. Fresh water pearls are here in abundance with their milky shades of cream, lemon and white, on offer for a pittance. A vast array of sea shells is also displayed, much of it having been fashioned into jewellery, key chains and tinkling chimes. It crosses your mind…does it eventually all get sold?Perhaps stuffed into suitcases and carried off to other lands where it’s appreciated…or sadly, perhaps not? And then there is the abundant coconut merchandise, carved into spoons, bowls and combs or left in its organic form of cooling coconut juice. Hollowed coconut shells appear stuffed with orchids, hanging here and there, thriving in the sultry air. I notice slivers of bamboo that have been coaxed into welcome mats, baskets, water buckets, paddy-bins and rice vessels. Rice is vital to daily life; what with carrying, threshing, winnowing and measuring of its vital staple. Pliable cane is also abundant and forms the basis of many kitchen essentials. Most of all the bird cages speak to me. Intricate strips of bamboo have been crafted into round, square or hexagonal enclosures. They’re not gilded, but somehow the earthy material seems less restrictive for the ruffled birds that inhabit them. 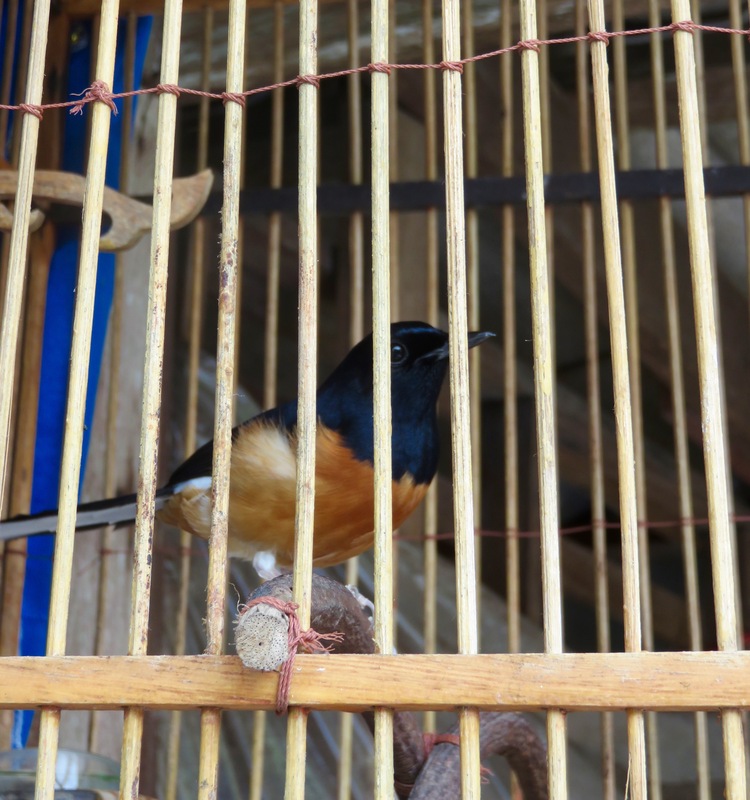 Cages hang in most store fronts, between narrow strips of buildings and in shady corners of simple homes. The lyrical chirps and serenades seem to lighten the lanes and distract from the still, suffocating air. I ask about the cages as I approach a shop. “Sawadee-kaa,” a man greets me as he comes forward from the shadows of his home to his shop front. His batik sarong is knotted at his lean waist and he seems open to conversation. “Bird competitions very important in Southern Thailand,”he tells me with a knowing smile. “High status to have winning bird. Which bird can sing best, longest, maybe happiest.” The affection for his feathered friends radiates from his eyes. 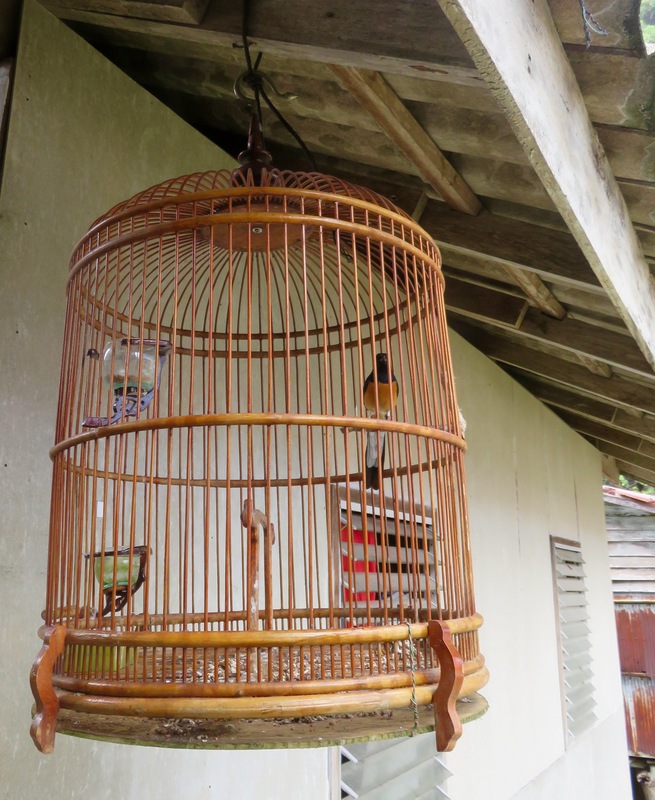 “What kind of birds do you have,” I ask, noticing multiple cages in his home. “Hmm, I didn’t know,” I admit, and it dawns on me that I’m surrounded by more than just pet birds. They’re performers, competitors, even prize winners. And they’re discerning. “Rainy day very bad,” the shop keeper assures me, motioning to the patter of rain on the tin awning above us. I discover that competitions are cancelled if there’s rain, for seemingly the birds are only willingly to serenade when the sun shines. Competitions are held in open fields with the location only revealed to those who enter, and maybe to those who want to bet a bhat or two. And perhaps not surprisingly the earthly competitors are men…it seems it’s a man’s pastime. I linger at the cages, watching the birds flutter and flit. It’s easy to adore these delicate aviary homes and appreciate the valuable species inside them. I check the latches of their tiny doors; and yes, they’re most certainly locked. We make our way out of the covered market street, desperate for a breath of air. 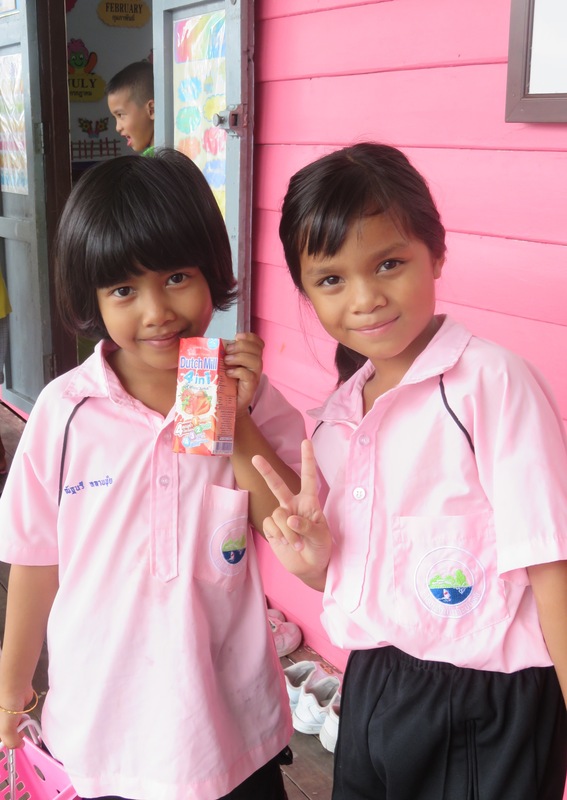 The chatter of school children greet us as they slide into their shoes that await outside the classroom doors. The open-air school transports me back to schools that my sons attended in Qatar and Oman with their hallways open to the elements. As here, I find it creates a joyous, uninhibited atmosphere as children go about their studies and play. Happy memories of my children’s early school days flood back to me and I am transported by the familiar scene. 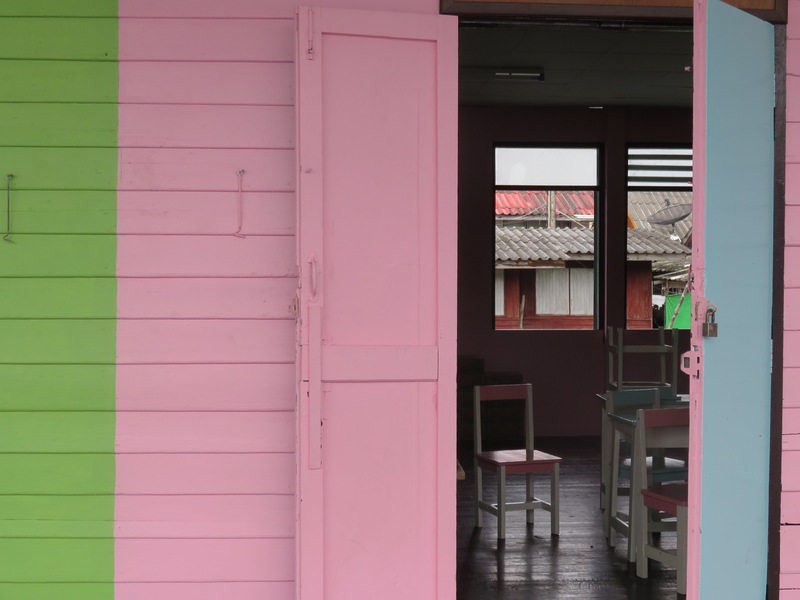 This island school is awash with colours of pink, baby blue and sea green; uniforms for both girls and boys alike are a soft pink. The youngsters play tag, giggle for photos and gather for after-school band practice. It’s difficult to pull myself away from their carefree presence. But the moment is soon lost as yet more tourists pace through the school yard. I peek down a side hallway for quiet. 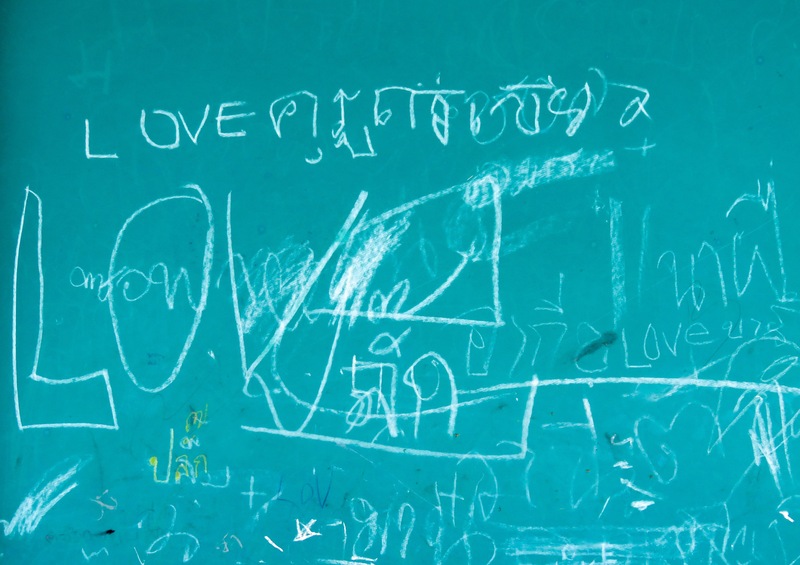 I delight in a scribbled note on a chalkboard in both English and Thai. I gaze out to the calm of the scenery that encloses Koh Panyee. Yet more boats crammed with eager tourists are edging their way towards the stilted settlement, eager to see the sights – part of me is dismayed with our intrusion. I imagine there is a serenity that returns to this community at nightfall, when the tourists retreat and the waters are silent from boat engines. Around 1700 souls live here and I’ve been welcomed into their unique way of life. For the villager’s sake, I hope their culture is preserved despite the continuous curiousity of tourists. Today, I was yet another of those tourists. 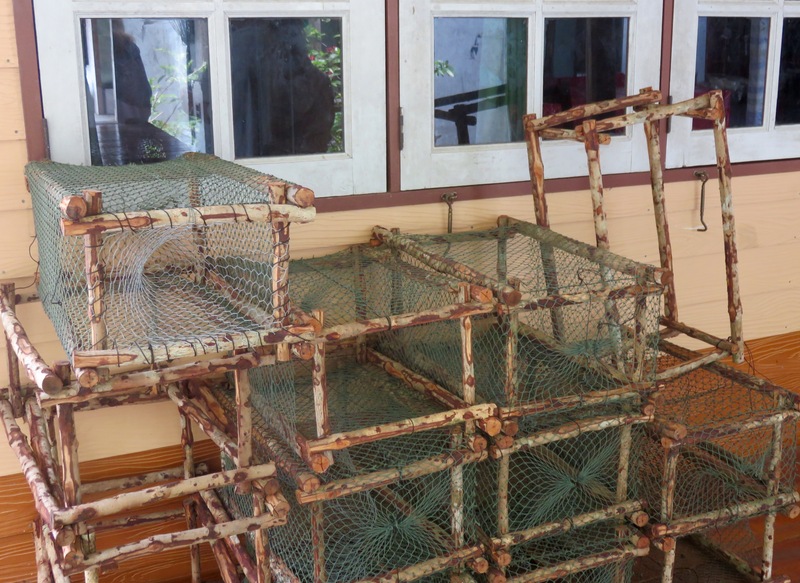 I took away some strands of pearls and appreciated the ‘little things’…like intricate bamboo bird cages, smiling children absorbed in their school day and the camaraderie of fellow writers on a field trip that we Phuket Paradise Writer’s, happily found ourselves on.